In his quest to find the best way to grow edibles without pesticides, Mr Teo Hwa Kok, 55, designed a “growing tower” made out of PVC pipes. In community gardens found in housing estates, schools and even offices, urban farms are taking root in Singapore. Such farms are not ornamental gardens. Instead, gardeners plant vegetables and fruit such as cabbage, basil and lime to eat. Urban farms have always been popular with gardeners in Singapore, especially those who volunteer at neighbourhood community gardens. The National Parks Board's popular Community In Bloom programme - a nationwide gardening initiative which started in 2005 - has more than 1,000 community gardening groups today. About 80 per cent of the groups in Housing Board estates grow edibles in their community gardens. But urban farming has become more high-tech and, well, urban. Urban farmers have started growing food in restaurants and taken over unused rooftop carpark spaces to set up garden plots. Three urban farms stand out for their ingenuity. The first is by a group of engineering students who have combined two aquaponics methods to get a larger harvest with more variety. The second is by a businessman who used to sell raw materials for pesticides. He has invented a "growing tower" that does away with chemicals. The last and most photogenic is by architecture practice Woha, which started an edible garden on the rooftop of its Hongkong Street shophouse office. The gardening enthusiasts in the office have designed a photogenic farm, filled with lush greenery and decorated with stylish outdoor furniture. Staff harvest vegetables and herbs such as kangkong and lemongrass to put in their salads or cook for office parties. 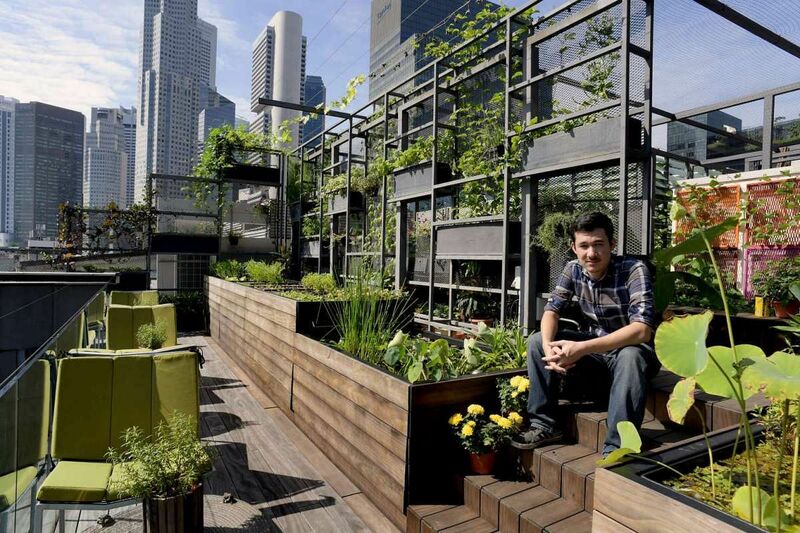 The Straits Times checks out these three urban farms. When it comes to starting an urban farm, creating a good-looking set-up isn't usually top on the to-do list. But for Woha, a home-grown award-winning architecture practice known for working greenery into its buildings, such as Parkroyal on Pickering hotel, urban farms can be useful and pretty. The firm used the rooftop of its Hongkong Street office shophouse as a test bed for a 2,100 sq ft organic urban farm with more than 100 species of edible plants, including kangkong, basil, pandan, dill and bittergourd, which are shared among the staff. Other than providing food, it is also a scenic place for staff to relax and destress, even if they are not interested in gardening. The project, which cost $50,000, was completed last month. Two rows of aquaponics planter beds, brimming with edible greens, are housed in sustainably treated pine wood boxes. The heights of these boxes have been designed so that gardeners need not bend over or squat when tending to the plants. Behind these planters is a metal frame that is fitted with more planter boxes placed at different heights. Flowering vines such as passionfruit and vanilla twine and creep up the metal frame. Some have even extended themselves across the wires overhead. When more of these vines grow to maturity, they will create a canopy that will provide some shade in the open-air area. Other highlights include an aquaponics system, which consists of a tilapia fish pond and a sloped planter bed. The system has water running through custom-made stainless steel water spouts. Across a short landing of wooden steps is a serene pond, centred by a tall kaffir lime tree. Outdoor tables and chairs have been put in so that Woha's staff can pop up to the farm for a break. Members of the firm's gardening club gather every Friday and spend about an hour tending to the plants. A gardening workstation for potting and propagation and a large tank that collects rainwater to water the plants are kept out of sight at the back of this urban farm showpiece. The office also makes its own compost from food scraps. Architectural designer Jonathan Choe, 28, who is the head of the gardening club, says they are looking to rear chickens there too. He was part of the core team, including Woha founders Wong Mun Summ and Richard Hassell, that designed and built the farm. He says: "We're not a commercial farm, where we grow vegetables just for food. It's also a beautiful sky garden, which the staff can enjoy." In a corner of Eng Kong Cheng Soon community garden in Lorong Kismis stands an industrial-looking set-up that contrasts sharply with the thriving greens in the soil. A fish tank, filled with black African tilapia, is connected to long grey pipes which have cut-out holes in them. The seedlings of leafy vegetables are planted in net pots placed in these holes. Their roots dangle in the pipes and absorb the nutrient-rich water flowing through. Above the fish tank is a container filled with clay pellets. Edible plants grow here, watered by the fish tank too. The entire set-up is shaded by a plastic canopy that lets sunlight in, but keeps rain out. 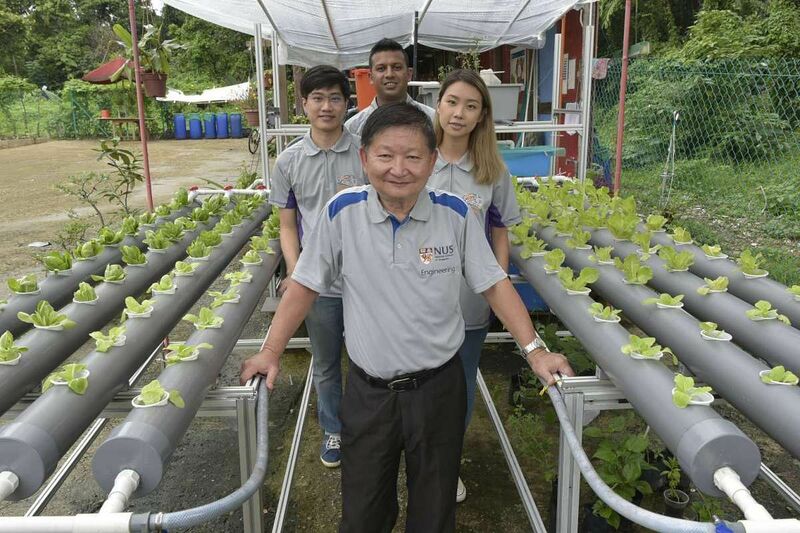 This hybrid aquaponics system has yielded about 6kg of vegetables, such as butterhead lettuce, spring onion and Chinese cabbage, in the last two months. The bountiful harvest is the result of a final-year project by three engineering students at the National University of Singapore (NUS). The students built the system from scraps they found in their school's workshops. It took a few months to design and construct the 251 sq ft system, which is about the size of a room in an HDB flat. Aquaponics combines aquaculture, the raising of edible fish, with hydroponics, growing vegetables without soil. There are three ways to set up an aquaponics system, though common elements include having a fish tank and a soil-free plant bed. Both fish and plants are cultivated in one system. The fish waste provides organic fertiliser for the plants and the plants filter the water for the fish. The students kept these basic features and combined two aquaponics methods - media-filled beds and Nutrient Film Technique - into one system, allowing them to grow a greater variety of plants. The media-filled containers are good for growing plants such as tomato, brinjal and chilli. These have long stems that are kept sturdy by the clay pellets. Leafy vegetables, which have shorter stems and long roots, are better suited for the Nutrient Film Technique - grown in net pots. The fish can also be eaten once they are fully grown. The set-up is fully automated so they have to check in only once a week. The students decided to work out of the community garden as they would be among seasoned gardeners. Ms Boo Jia Yan, 23, says: "There was a lot of experimentation and we had little knowledge of farming. Here, we were able to get advice about what could be improved." They have plans to fit in high-tech features such as solar panels, which can generate electricity to power the system and install a device that allows for remote monitoring. The set-up has attracted interest from two home owners. 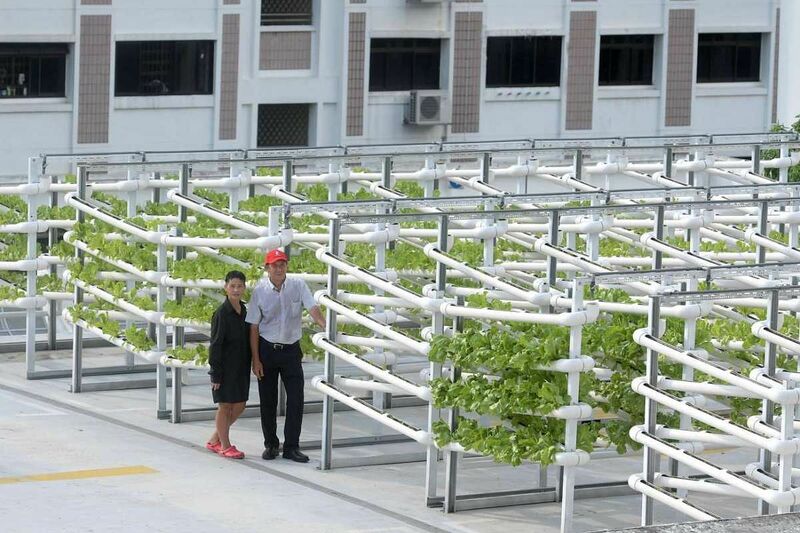 Associate professor Lee Kim Seng of NUS' mechanical engineering department, who supervised the project, hopes more people will take on urban farming. "It's a very easy set-up. Why not utilise the waste to grow something good?" At a multi-storey carpark rooftop in Kang Ching Road, 164 "growing towers" covered in leafy green vegetables rise to the sky. Standing at 1.8m tall and lined up next to one another, these gardening systems are the result of years of research and development by Mr Teo Hwa Kok, 55, chairman of organic farming company Citiponics. They have been used to produce about 25 types of vegetables and herbs, such as butterhead lettuce, spinach, dill, kailan, sweet basil and mizuna, a member of the mustard family. At the base of each tower is a tank filled with water and nutrients. The mixture is pumped up to the top of each tower and flows down by gravity through a series of seven pipes arranged in a zig-zag manner. The pipes have holes cut into them, creating pockets. Tiny clay pebbles, which have been cut to a specific size, fill these pockets. Seeds are placed among the pebbles, which is the growing medium for the plants. As the water is constantly in motion, mosquitoes cannot breed. Also, no pesticides are used. This is an improvement over some traditional hydroponics systems, which use water as a growing medium. This means that water can be stagnant in some parts. Mr Teo says his version is lighter as it uses less water and can be built to any height. The produce, which is harvested by volunteers from a nearby Residents' Committee centre, is given free to needy residents in Taman Jurong. Mr Teo has been involved in the farming business for a long time, though he was not always a farmer. The Malaysian moved to Singapore in 1987 to work for a pesticide company. He quit in 1993 and set up his own venture selling raw materials used to make pesticides. But as he read more reports about pesticides being misused and affecting food safety, he started to look into organic farming. "It gave me an uncomfortable feeling so I decided to look into other ways to grow plants." In 2001, he set up a 3ha organic farm in Malaysia, growing vegetables in soil. It did not take off and he gave it up about two years later. He calls it a "very expensive experience" as consumers were not ready to pay high prices for pesticide-free vegetables then. About seven years ago, he decided to try organic farming again and came up with the prototype for the growing towers. 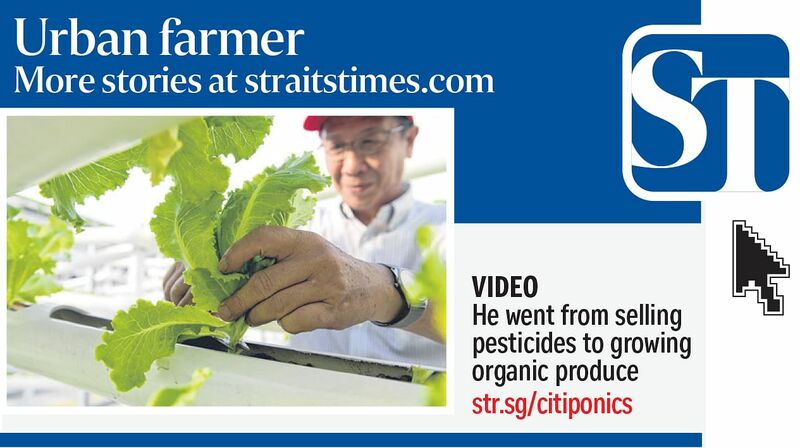 He operates Citiponics with the help of Madam Jenny Toh, 55, who used to work in his pesticides business. Citiponics has taken its growing towers to China and Malaysia. On average, each growing tower costs about $4,800 and Mr Teo says it can last 20 years. A harvest from one tower can weigh between 5 and 10kg, depending on what vegetable is grown. For his next green project, he wants to look into making pesticide-free feed for chicken and fish. "Maybe one day, we can reduce the use of pesticides. Until then, we have to keep pushing ourselves to improve the safety of our food."